Your Cheques will become Invalid from Jan 1, 2013 – Find out WHY? It might happen that your cheque’s start bouncing and do not get accepted from Jan 1, 2013 . There is a new standard in banking called as Cheque Truncation System or CTS 2010 , which all the banks have to follow now. RBI has issued a circular telling all banks that they should only process and accept those cheques which follow CTS guidelines. What is Cheque Truncation System or CTS? 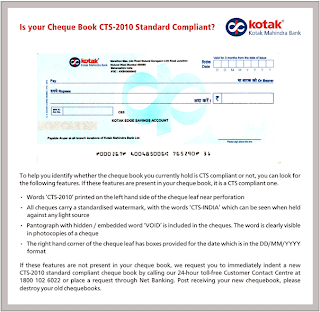 All CTS-2010 cheques will have a watermark with the words “CTS INDIA”, which can be seen against a light. You will have to sign the cheque will a darker ink, so that your signatures are valid for scanning. If you look at these features, you can simply see that these are required for digital processing and once these Cheque Truncation System enabled cheques arrive , the whole banking system will start clearing the cheques in a must faster time. This will improve banking and save paper . 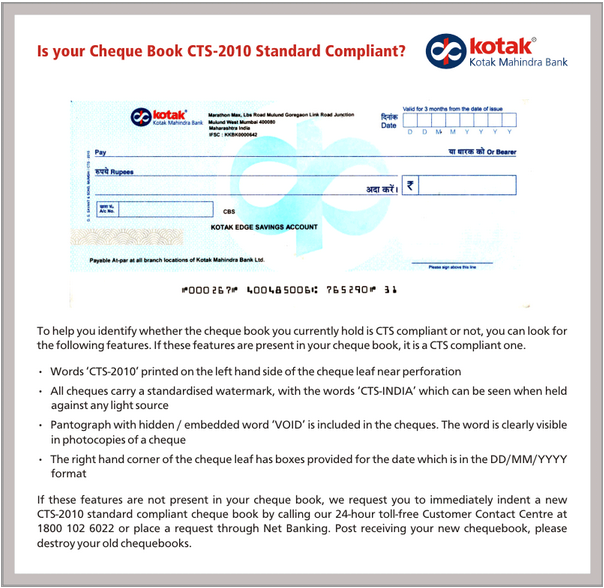 Below is a sample of cheque which fulfil CTS criteria’s. SBI has already told all its customers to get new cheques because all the old cheques will become invalid , In the same way HDFC bank and ICICI bank have also told their customers to get new cheque books. What you must do ? At times, we accumulate old cheques and deposit them for clearing only after many days or weeks. If you have any cheque which is to be cleared, better deposit it and encash ! A lot of banks have also asked its customers to give return back the old invalid cheques at their branch and collect new cheques, not sure why they need old cheques , why cant they issue the new cheques directly ? Also note that the cheques will be sent to the last updated address only. Learn more about CTS here. I hope you are clear about Cheque Truncation System (CTS) and how your cheques will become invalid from Jan 1,2013. LETTER FROM A YOUNG CA WIDOW......Her Traumatic Experience On Death Of Her Husband! I have to share a few things I learnt after Mithun's death. We always believe we will live forever. Bad things always happen toothers. Only when things hit us bang on our head do we realise. Life isso unpredictable. .
My husband was an IT guy. All techie. And I am a chartered accountant. Awesome combination you may think. the passwords were alpha-numeric with a special character not an easy one to crack. Office policy said passwords needed to be changed every 30 days. So every time I accessed his laptop I would realise it's a new password again. I would simply opt for asking him 'What's the latest password' instead of taking the strain to memorise it. you have to be epitome of Reliability / Competent / Diligent etc., but at home front there is always a tomorrow. the beginning. I realised I had lot to learn. 9 years married to one of the best human beings, with no kids, just the two of us to fall back on..but now I stood all alone and lost. 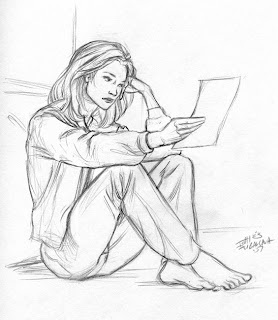 Being chartered accountant helped in more ways than one, but it was not enough. I needed help. His saving bank accounts, his salary bank accounts had no nominee. On his insurance his mom was the nominee and it was almost 2 years back she had expired. but this was just a start. claimed his shift allowance, his mobile reimbursement. The house we bought with all the excitement on loan, thought with our joint salary we could afford the EMI. When the home loans guys suggested insurance on the loan, we decided instead of paying the premium, the difference in the EMI on account of the insurance could be used to pay towards prepayment of the loan and get the tenure down. We never thought what we would do if we have to live on a single salary. So now there was huge EMI to look into. I realised I was in for a long haul. Road accident case, so everywhere I needed a Death certificate, FIR report, Post Mortem report. For everything there were forms running into pages, indemnity bonds, notary, surety to stand up for you. no objections certificates from your co-heirs..
Then came the time you realise now you have to start changing all the bills, assets in your name. Your gas connection, electricity meter, your own house, your car, your investments and all sundries. And then change all the nominations where your own investments are concerned. And again a start of a new set of paperwork. To say I was shaken, my whole life had just turned upside down was an understatement. You realise you don't have time to morn and grieve for the person with whom you spend the best years of your life, because you are busy sorting all the paper work. I realised then how much I took life for granted. I thought being a chartered accountant I am undergoing so many difficulties, what would have happened to someone who was house maker who wouldn't understand this legal hotchpotch. A sweet friend then told me dear this was not an end. You have no kids. Your assets will be for all who stand to claim after my hubby's sudden death. I realised it was time I took life more seriously. I now needed to make a Will. I would have laughed if a few months back if he had asked me to make one. But now life had taken a twist. Lessons learnt this hard way were meant to be shared. After all why should the people whom we love the most suffer after we are no more. Sorting some paperwork before we go will at least ease some of their grief. It's a usual practice to put a name (i.e in the first place if you have mentioned it) and royally forget about it. Most of us have named our parent as a nominee for investments, bank accounts opened before marriage. We have not changed the same even years after they are no longer there with us. Even your salary account usually has no nomination.. Kindly check all your Nominations. We have passwords for practically everything. Email accounts, Bank accounts, even for the laptop you use. What happens when your next in kin cannot access any of these simply because they do not know your password. Put it down on a paper. Every year for tax purpose we do investments. Do we maintain a excel sheet about it. If so is it on the same laptop of which the password you had not shared? Where are those physical investments hard copy? Registration of Partnership Firm… Why? and How? You may want to start a partnership firm with some of your acquaintance. One may wonder whether to register his partnership firm or not when it is not statutorily compelled. Yes, the registration of Partnership in India is not compulsory under Indian Partnership Act 1932. Yet, the unregistered partnership firms lack certain advantages in its future business course. For example, in the unregistered firm the expenses viz., payment of salary, commission, interest on borrowings or drawings are not considered as allowable expenses for determination of total income for payment of tax. Is that it? No… there are more which is detailed below. Entrepreneurs desirous of setting a partnership firm should apply in the prescribed form (Form No. 1) to be submitted to the Registrar of Firms on their jurisdiction with prescribed fee. The application must be signed by all the partners or their authorised agents. • Date of Joining the Firm. • Duration of the firm. The duly filled Form 1 shall be submitted along with the required proof before the Registrar of Firms. The details will be verified and then the register will issue the certificate of registration. An unregistered firm cannot file a suit against a third party in its name to enforce its legal rights. Partners of an unregistered firm cannot file any suit to enforce a right against the firm. The firm might be disabled from participating certain Tenders or contracts which mandates the registration of the partnership firm. So, needless to add the registered partnership firms avail vice versa of above limitations. It is further advisable to consult a competent lawyer to proceed with the registration of your firm. Disclaimer: The above contents are mere information and shall not be considered as legal opinion. The Government of Tamil Nadu by Act No. 21/2009 and G.O. (Ms) No. 987 Home (Courts IV) Department dated 24.11.2009 has made it compulsory the registration of all marriages of all persons who are citizens of India belonging to various religions in this State. This has came into effect from 24.11.2009. The marriages, even though registered under the Hindu Marriages Act, 1955, the Indian Christian Marriage Act 1872, the Special Marriage Act 1954, the Mohammadian Shariat Marriage Act and all other marriages done under any other law, are required to be compulsorily registered under Section 3 of this Act as well. Failure of Registration of marriage within 90 will attract penalty and penal action. In addition to the above, the memorandum of application to be submitted in duplicate along with 6 passport size photograph for bride and bridegroom. Ø Marriages solemnized under any personal law can be registered. Ø It can be registered within 90 days without fine and within 90-150 days with fine. After that it can't be registered. Ø Marriages solemnized before the Registering officer or in any other form. Ø Bridegroom/Bride should have completed 21/18 years respectively. Ø Proof for all the above shall be given. Ø Notice of intention of marriages. Ø If no objection for the marriage is received within 30 days from the notice, marriage will be registered. Competent authorities in the Chennai Corporation, the Chennai Metropolitan Development Authority, the Directorate of Town and Country Planning and municipalities will start accepting applications to condone unauthorised buildings constructed before July 1, 2007, for a fee.The State government this week issued guidelines under Section 113-C of Tamil Nadu Town and Country Planning Act, 1971 for the exemption of unauthorised buildings from regulations. The guidelines will facilitate assessment of the violations and collection of the amount for exemption. The guidelines will cover any building or class of buildings developed on or before July 1, 2007 and deviated from three provisions of Floor Space Index, setback requirements and road width of the Tamil Nadu Town and Country Planning Act, 1971. The applications for exemption will be rejected if the extent of violations in respect of minimum required road width exceeds 20 per cent. Violation in respect of minimum setback spaces around such unauthorised building shall not exceed 50 per cent. Floor Space Index shall not exceed 50 per cent of the allowable limit. The competent authority such as the Corporation Commissioner will examine the application and forward it to the government for passing orders under Section 113-C of the Act, along with the remarks of the official. After the government passes orders exempting such unauthorised buildings, the competent authority will assess the amount of exemption and issue a demand notice for the payment of the charges. Any aggrieved person may prefer an appeal within 30 days of receipt of the order to government in Housing and Urban Development Department in the case of Chennai Metropolitan Area. The appeals pertaining to areas other than the Chennai Metropolitan Area have to be made to Commissioner of Town and Country Planning. The guidelines have been made based on the recommendation of Justice Mohan Committee set up in 2007 to look into ways to improve the Town and Country Planning Act. The committee gave a series of suggestions, such as enhanced penalties and powers to lock and seal illegal buildings. In 1998, the government amended the Town and Country Planning Act and regularised illegal constructions completed before 1998. The State also extended regularisation schemes in the 2000, 2001 and 2002. It is respectfully submitted that the author is unable to agree with this judgment of hon’ble Supreme Court for the following reasons. Let us examine in brief the facts and the reasoning given by the hon’ble Court. This appeal arises out of the final judgment and decree dated 11th of May, 2006 passed by the High Court of Delhi at New Delhi in RFA No.71 of 1985 whereby the High Court had set aside the judgment and decree dated 12th of November, 1984 passed by the Additional District and Sessions Judge dismissing the suit filed against the appellant who was a guarantor in respect of loans advanced by the Punjab National Bank (in short 'the Bank') respondent no.1, to M/s Rangaa Trades and Exports Pvt. Ltd. respondent no.2, in this appeal. By the impugned judgment, the High Court affirmed the decision of the Additional District and Sessions Judge and held that the suit filed by the Bank be decreed against the original defendant Nos.1 to 4 for a sum of Rs. 42,874/- including interest at the rate of 19.5 per cent per annum with quarterly rests from the date of filing of the suit till realization. At this stage, we may note that the said decree against the defendant nos.1 to 4 has now become final as no appeal was preferred by the said defendant nos. 1 to 4 against the said decree. Feeling aggrieved by the aforesaid judgment of the High Court, the special leave petition was filed by the guarantor appellant before Hon’ble Supreme Court. "2. The guarantors hereby guarantee jointly and severally to pay the bank on demand all principal, interest, costs, charges and expenses due and which may at any time become due to the Bank from the borrower, on the accounts opened in respect of the said limits (hereinafter called the 'said accounts') down to the date of payment and also all loss or damages, costs, charges and expenses and in the case of legal costs, costs as between attorney and client occasioned to the Bank by reason of omission, failure or default temporary or otherwise in such payment by the Borrower or by the Guarantors or any of them including costs (as aforesaid) of enforcement or attempted enforcement of payment by suit or otherwise or by a sale or realization or attempted sale or realization of any security for the said indebtedness or otherwise howsoever or any costs (which costs to be as aforesaid) charges or expenses which the Bank may incur by being joined in any proceeding to which the Bank may be made or may make itself party either with or without others in connection with any such securities or any proceeds thereof. Keeping the agreement of guarantee, as noted hereinabove, in mind, let us now look into the facts of the present case. It is an admitted position that the guarantee issued by the appellant to the Bank was subsequently cancelled by his letter dated 31st of July, 1980 written to the Manager of the Bank and in that view of the matter, the appellant sought to substantiate his case that since his guarantee had stood revoked before the loan was in fact taken by the defendants from the bank, in view of Section 130 of the Indian Contract Act, 1872 (in short "the Act"), he was not liable to pay the loan taken by the defendants in respect of which the appellant was a guarantor. The trial court, as noted herein above, dismissed the suit against the appellant and in appeal by the Bank, the High Court had reversed the decree passed by the trial court and granted decree in favour of the Bank and against the appellant. Subsequent to the revocation of guarantee by the appellant, there were transactions in respect of the loan between the defendant Nos. 1 to 4 and 6 and the bank. The suit was filed for recovery of loan by the Bank against the appellant as well as the other defendant Nos. 1 to 4 and 6. "Revocation of continuing guarantee: A continuing guarantee may at any time be revoked by the surety, as to future transactions, by notice to the creditor." The defendants guaranteed the repayment of bills to be discounted by the plaintiffs for Davies & Co. for 12 months not exceeding 600 pounds. The defendants revoked the guarantee before any bill was discounted. But the plaintiffs discounted the bills which remained unpaid. Hon’ble High Court of Himachal Pradesh in Anil Kumar and others Vs. Central Bank of India and others (AIR 1997 HP 5) has held (in para 16 and 17) that in the case of a continuing guarantee, every credit given is a separate transaction which makes the surety irrevocably liable, but he may free himself from further liability. Hon’ble High Court of Madras in Hargopal Agarwal v. State Bank of India (AIR 1956 Mad 211) has held that where the directors of a company guaranteed the payment of company’s overdrafts and subsequently resigned their office and the bank was informed, it was held that the liability of the directors would be confined to the amount due up to the date of their resignation. As per P Ramanatha Aiyar’s the Law Lexicon, 2nd Edition 1997(Reprint 2007) the term “Benefit” means advantage, profit or gain of any kind. On the other hand the term “Right” means an interest which is recognised and protected by law. As it is recognised by law a man is entitled to have it. As it can be protected by law the possessor can enforce it by an appropriate action in a court. (Raj Rajendra Sardar Maloji Narsig Rao Vs. Shankar Saran, AIR 1958 All 775, 787). It is respectfully submitted that the Act had been enacted to codify the rights and liabilities of the parties who have entered into a contract and not to confer any benefit in favour of respective parties. The Indian Contract Act, 1872 can not be called a ‘beneficent legislation’ by any stretch of imagination. It is evident that paragraph no. 4 of Agreement of Guarantee does not include Section 130 of the Act, therefore, as per the facts of the case there is no express waiver of Section 130 of the Act by the Guarantor. In view of that, it is respectfully submitted that the Hon’ble Court by its observation (in para 7 of the judgment) has concluded a presumed waiver of Section 130 of the Act by the Guarantor by reason of the language used in clause 2 of agreement of guarantee with the Bank, reproduced in para 3 above. Now, therefore, in this context let us examine the earlier case laws as to whether there could be a presumed waiver of the provisions of the Act, keeping in view the fundamental right of equal protection of laws provided in Article 14 of the Constitution of India. Article 14 runs as follows: "The State shall not deny to any person equality before the law or the equal protection of the laws within theterritory of India." "On behalf of the respondent Bank reference was made to cl. 5 of Ex. P-4 which has already been quoted. It was contended that on account of this clause in Ex. P-4 the appellant has opted out of the benefit of s. 141 of the Indian Contract Act. We are unable to accept the argument put forward by the Attorney General on behalf of the respondent Bank. In our opinion, the expression "any security" in cl. 5 of Ex.P-4 should be properly construed as "any security other than the pledge of goods mentioned in the primary agreement, Ex. P-1 between the Bank and the firm." We consider that there is nothing in cl. 5 of Ex.P-4 to indicate that the appellant is not entitled to invoke the provisions of s. 141 of the Indian Contract Act. A bare perusal of clause 13 would show that it provides for continuing the guarantee where the principal debtor is an association of persons and for continuance of the guarantee in the event of death, retirement, etc. of one of such association of persons or the guarantee remaining intact and effective and legally enforceable irrespective of some defect arising from the internal management of such association of person. We fail to see how it can render any assistance to the Bank. First security, namely, the pledged goods are lost to the Bank and the concurrent finding again incontrovertible is that the pledged goods were lost on account of the negligence of the creditor Bank. Whole of the security was lost and, therefore the surety would be discharged in entirety because it is crystal clear that the principal debtor had agreed and had in fact pledged 5,000 tins of oil which even if sold at the then current market price would have satisfied the Bank's entire claim. Accordingly, the surety would be discharged in entirety. (2) an offer is made irrevocable by acceptance. D made a written offer to O that, if he would discount bills for another firm, they (D) would guarantee the payment of such bills to the extent of Pound 600 during a period of twelve calendar months. Some bills were discounted by O, and duly paid, but before the twelve months had expired D, the guarantors, revoked their offer and notified O that they would guarantee no more bills. O continued to discount bills, some of which were not paid, and then sued D on the guarantee. It was held that the revocation was a good defence to the action. The alleged guarantee was an offer, for a period of 12 months, of promises for acts, of guarantees for discounts. Each discount turned the offer into a promise, pro tanto, but the entire offer could at any time be revoked except as regards discounts made before notice of revocation." The learned author, as noticed from the passage quoted herein before, clearly stated that an offer may be revoked even before it is accepted. Section 13 of the Act has defined "Consent" – Two or more persons are said to consent when they agree upon the same thing in the same sense. Section 20 of the Act has defined "Mistake" – Where both the parties to an agreement are under a mistake as to a matter of fact essential to the agreement, the agreement is void. Explanation.- An erroneous opinion as to the value of the thing which forms the subject-matter of the agreement is not to be deemed a mistake as to a matter of fact. If a mistake as to nature of promise is common to both parties, the agreement is void under section 20, the parties being mistaken about the very nature of the promise. But more frequently a mistake of this kind is brought about by the fraud of one party. One of the parties, being under a duty to do so, fails to disclose to the other the true nature of the document and thereby induces him to sign the same under the belief that he is signing some other instrument of a different nature. In such a case there is no real agreement as the consent is nullified by the mistake. This distinction has been indorsed by hon’ble Supreme Court in following case ……………. (not reproduced here). (Source: The Book ‘Law of Contract and Specific Relief’ by Dr. Avtar Singh). It is pertinent to note here that the Dictionary meaning of the word “fraudulent” is “to Defraud”. As per P Ramanatha Aiyar’s “The Law Lexicon” 2nd edition 2007 at page no. 511 the word “Defraud” means to deprive of some right, interest, or property by deceitful devices. All courts in India are bound to follow the decision of the Supreme Court even though they are contrary to the decisions of the House of Lords or of the Privy Council. ‘Law declared’ – In case of conflict between decisions of the Supreme Court itself, it is the latest pronouncement which will be binding upon the inferior courts; unless the earlier was of a larger bench. If the later decision is that of a larger bench the previous decision will be deemed to have been overruled and completely wiped out. This rule is followed by the Supreme Court itself. 20.1 As detailed above, hon’ble Supreme Court in Provash Chandra Dalui & Anr (supra) has held that the essential element of waiver is that there must be a voluntary and intentional relinquishment of a known right or such conduct as warrants the inference of the relinquishment of such right. It means the forsaking the assertion of a right at the proper opportunity. Further, hon’ble Supreme Court in Smt. Dularia Devi (supra) observed that in Ningawwa v. Byrappa & 3 Ors (supra) this Court said the legal position will be different if there is a fraudulent misrepresentation not merely as to the contents of the document but as to its character. The authorities make a clear distinction between fraudulent misrepresentation as to the character of the document and fraudulent misrepresentation as to the contents thereof. With reference to the former, it has been held that the transaction is void, while in the case of the latter, it is merely voidable. 20.2 As per the facts of this case it is an admitted position that the guarantee issued by the appellant to the Bank was subsequently cancelled by his letter dated 31st of July, 1980 written to the Manager of the Bank. It appears that the mistake as to nature of promise was brought about by the fraudulent misrepresentation as to the contents of agreement of guarantee by the Bank, being under a duty to do so, failed to disclose to the guarantor the true nature of the agreement of guarantee and thereby induced him to sign the same under the belief that he is signing an agreement of guarantee, which is fair to both the parties, but on the contrary it was having one sided monopolistic conditions absolutely in favour of the Bank. In such a case, there is no real agreement as the consent is nullified by the mistake. The essential element of waiver is that there must be a voluntary and intentional relinquishment of a known right. It means the forsaking the assertion of a right at the proper opportunity. In the case in hand, as soon as the guarantor came to know the true nature of the agreement of guarantee he subsequently cancelled his guarantee by his letter dated 31st of July, 1980 written to the Manager of the Bank and in that view of the matter, since his guarantee had stood revoked before the loan was in fact taken by the defendants from the bank, in view of Section 130 of the Act, he was not liable to pay the loan taken by the defendants in respect of which the appellant was a guarantor. The guarantor asserted his right of revocation of his guarantee, as per Section 130 of the Act, at the proper opportunity. In view of that, it is respectfully submitted that the Hon’ble Court by its observation (in para 7 of the judgment) has erred in concluding a presumed waiver of Section 130 of the Act by the Guarantor by reason of the language used in clause 2 of agreement of guarantee by the Bank, which is a legal gimmick played by the Bank against the legitimate rights of the Guarantor. It is respectfully submitted that the determination of the Hon’ble Court is not consistent with the fundamental right enshrined in Article 14 of the Constitution. 20.3 A 5 judge Constitution Bench of hon’ble Supreme Court in Basheshar Nath vs. The Commissioner of Income-tax, Delhi & Rajasthan & another (supra, Date of judgment 19/11/1958) held (Per Curiam) that there could be no waiver of the fundamental right founded on Article 14 of the Constitution. Further, a 3 judge bench of hon’ble Supreme Court in State Bank Of Saurashtra Vs. Chitranjan Rangnath Raja And Anr. (supra, Date of judgment 30/04/1980) has held that it is difficult to entertain a contention that section 141 would not be attracted and the surety would not be discharged even if it is found that a creditor has taken more than one security. Should a Court by its construction of such letter of guarantee enable the creditor to act negligently and yet be not in any manner accountable ? It is respectfully submitted that aforesaid judgments, being of larger bench of 5 Judges and 3 Judges respectively, are binding on this hon’ble 2 Judge bench. It appears that aforesaid judgments were not taken into the notice of the hon’ble Court. It is expected that in the interest of justice the hon’ble Court will suo motu take up a review of this judgment at the earliest. Note: the views expressed are my personal and a view point only.